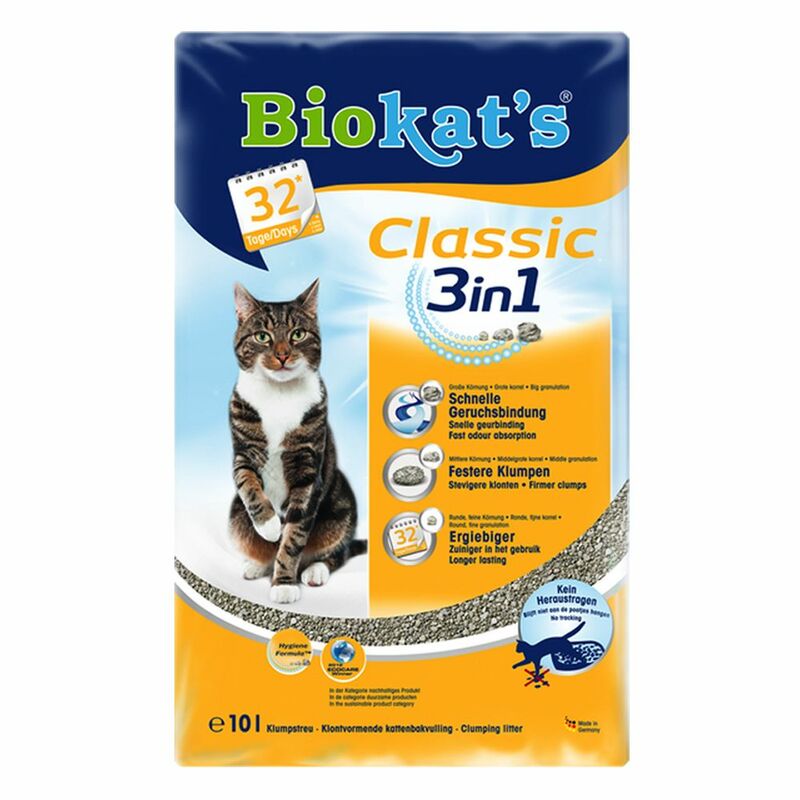 Biokat's ClaΒic 3in1 Cat Litter is a high-quality clumping litter made of three different sizes of granules. This unique combination supports a quicker odour binding, improves the firmneΒ of the clumps and allows for extra-economical use. This litter combines large, medium and small granules. The large granules have particularly large pores which absorb liquids and unpleasant odours like a sponge. The medium granules help to form extra firm clumps, as they are the perfect size the fill the gaps between the large and small granules. The small granules then help to make the litter very economical: they are well-distributed through the litter and support the efficiency of the large and medium granules. Biokat's ClaΒic 3in1 has a further advantage: its special mix of granule sizes means that it does not stick to your cat's paws, preventing it from tracking through your house. The litter is made of 100% natural clay sourced from controlled, ecologically sustainable open-pit mines in Germany. Biokat's ClaΒic 3in1 Cat Litter at a glance: High-quality litter for all cats Clumping cat litter with three different sizes of granules Large granules: with extra large pores for high absorbency and faster odour binding Medium granules: the ideal size to fill the gaps between the large and small grains, forming extra firm clumps Small granules: distribute perfectly throughout the litter, making it extra economical in use AromaProtect formula: contains unpleasant odours and instead releases a pleasant scent Non-tracking: grains will not stick to your cat's paws Cost effective: can be used for up to 32 days Pleasant scent: for permanent freshneΒ.